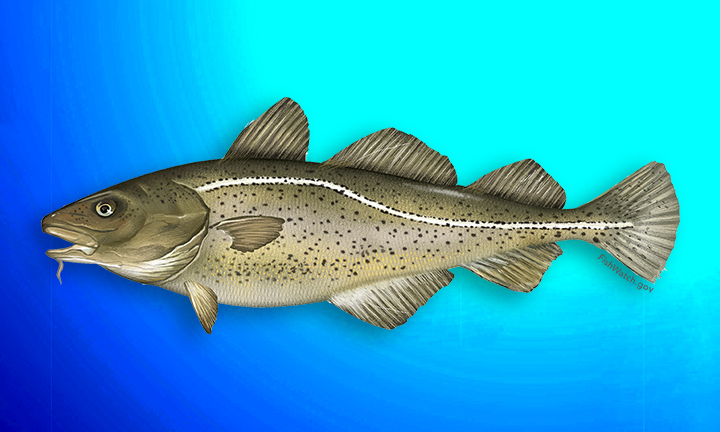 An icon of the North Atlantic, cod has been fished for more than 500 years, ever since the discovery of the New World. The fish lives in colder waters on both sides of the Atlantic and has been a traditional staple for Europeans and North Americans. The colour of cod varies depending on its habitat, ranging from reddish brown to pay grey-green. It can be identified by a small barbell that extends from the chin of the fish to its whiskers. It has three dorsal fins, an almost square, broom-shaped tail and a disproportionately large heard on a streamlined body that allows it to swim at moderate speeds. On average, code weigh 11 to 26 pounds (5 to 12 kg). It has large, tender flakes that make for an incredibly juicy, delicious fish – perhaps the reason it has long been one of the most famous fish species.